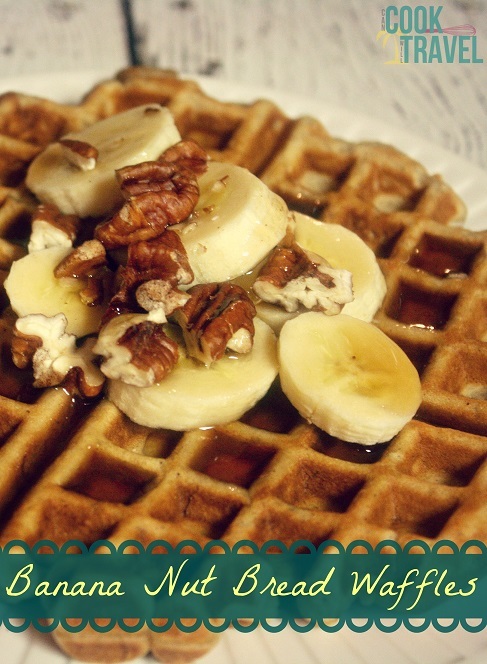 You are here: Home / Blog / Breakfast / Banana Nut Bread Waffles Means I Heart Breakfast Even More! Banana Nut Bread Waffles Means I Heart Breakfast Even More! Do you love breakfast food as much as I do? It’s hard not to, right?! I mean waffles, pancakes, breakfast burritos, casseroles, bagels, oatmeal … I could keep going. And what I adore even more is having breakfast for dinner. It’s like I’m being a mini rebel (I said mini) … take that, dinner! And I couldn’t stop thinking about this Banana Nut Bread Waffles recipe I saw on Pinterest over at the site Mother Thyme (cute name too!). So since I just couldn’t get this dish off of my mind, I had to make it. Plus, the bonus was I didn’t have to go to the grocery store … love when I have everything I need on hand! And seriously this was ridiculously easy. The only kitchen tool you’ll need to knock these waffles out of the park is a waffle iron. Obvious, I know – but you definitely need one, and you can get them pretty cheap these days. As I was whipping up these waffles up, I just knew they would be stellar. The batter had flour, a little sugar, baking powder & soda, salt, cinnamon, and a little freshly grated nutmeg. Then mix together 2 ripe bananas, some milk, eggs, a little canola oil, and vanilla bean paste. Mix all of that together, then stir in some nuts. I went for chopped pecans, because we had some on hand. Great choice! Then cook up the waffles based on the instructions that come with your waffle iron. And good Lord the smell as these cooked was INCREDIBLE!! It was like banana bread was baking … total winner, here. 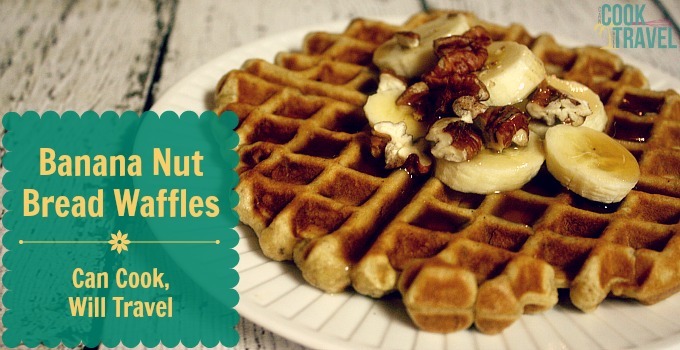 I CANNOT WAIT for you to try this Banana Nut Bread Waffles recipe! (Sorry to yell there, but if you love breakfast, you’ll adore this dish.) Be sure to click the link for the recipe and step by step instructions. Please, do it! One year ago: Homemade Pretzels with Sriracha Beer Cheese Sauce … Oh My Goodness, These Are Good!